It's risky to recommend a book you love to someone you don't know well; a book says something about who you are, and admitting you love something that someone else might read and hate? That's a small act of bravery. My neighbor took that risk when she recommended one of her favorite books to me, and I'm glad she did. 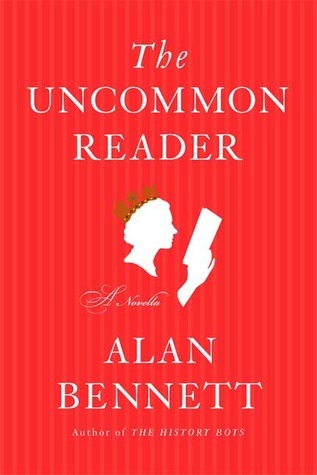 The Uncommon Reader by Alan Bennett is a delightful and deftly written novella about the Queen of England and her late-in-life discovery of the joy of reading. I loved Bennett's portrayal of Queen Elizabeth II. And who can argue with the life-changing power of books? 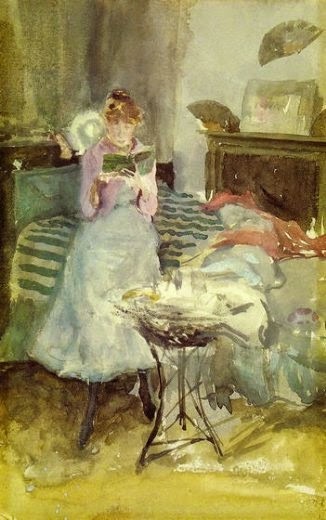 The appeal of reading, she thought, lay in its indifference: there was something undeferring about literature. Books did not care who was reading them or whether one read them or not. 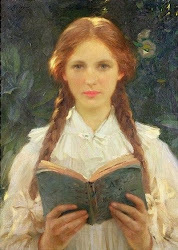 All readers were equal, herself included. ... (Reading) was anonymous; it was shared; it was common. And she who had led a life apart now found that she craved it. Here in these pages and between these covers she could go unrecognised. This witty novella is a lot of fun. And, at only 120 pages, it can be read in a day. I'm so glad my neighbor took a chance and recommended this book to me. It's a lovely read. 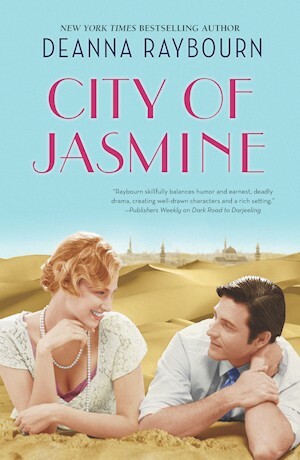 "...it began in Rome, as all adventures should..."
Those three words were all it took to make me want to read Deanna Raybourn's City of Jasmine. This is a fun adventure novel set in the 1920s, with just the right amount of romance. I really enjoyed it. Aviatrix Evangeline Starke has embarked on a trip to fly across the Seven Seas with her Aunt Dove when she receives a photograph of her late husband, Gabriel Starke, who appears to be very much alive. She follows this clue to the ancient city of Damascus where she must not only track down her missing husband, but a priceless relic as well. Smart, and a little bit headstrong, Evie Starke is a girl who can hold her own. She doesn't let any of the men in her life sway or control her, not even handsome and secretive Gabriel. I liked that about her. I also liked that she's not immune to love. In many ways, City of Jasmine, with its combination of mystery and romance, reminded me of my favorite M.M. Kaye novels. It's well-written, has some great dialogue, and is set in a fascinating time and place. In fact, it's the perfect summer adventure. 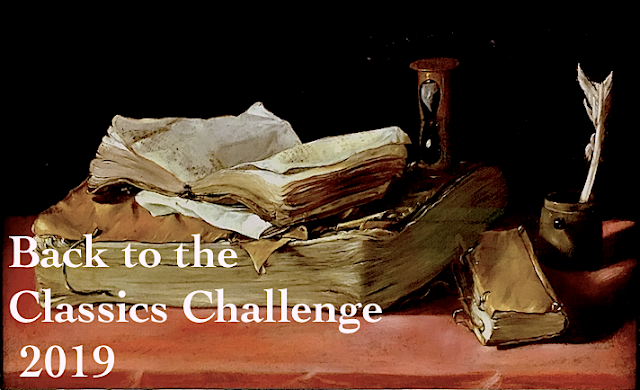 On things I could happily do without (in books). Weird fonts. Present tense. Stupid characters. "Instalove". Love Triangles (especially in YA novels). Alternating narratives. And excessive jumping from the past to the present and back again. (Pick a time period, people!) What about you? What are you sick of seeing in the books you read? but the one which makes you think." The dead don't walk among us, peering invisibly over our shoulders or watching us as we sleep. There are such things as hauntings certainly, but they are confined to certain spaces, tied to a place and often with a purpose, though they are in fact rare. The true dead, if you wish to speak with them, must be called. "Tell Ellie Winter to find me." That was the last message psychic medium Gloria Sutter sent before she was murdered at one of her own seances. Ellie Winter is psychic, too. 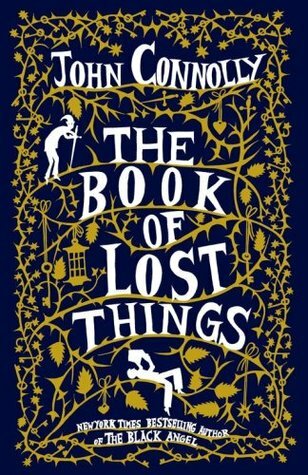 And though she saw her first ghost when she was seven, she finds lost objects, not people. And she certainly doesn't do seances. But she and Gloria were once friends, and Ellie can't let her murder go unsolved. 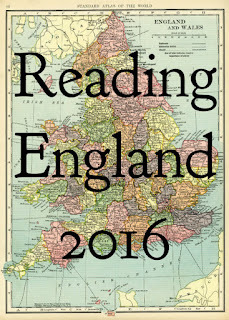 Set in London in 1925, this novel is more murder mystery than ghost story, although there are ghosts in it. Ellie, with her bobbed blond hair and psychic ability, is a fun character, as is James Rawley, the man who helps her track down Gloria's killer. Simone St. James always includes a little romance with her suspense which is why I love her novels so much. And this one is no exception. The romance between Ellie and James made me smile and sigh all at the same time. An arm came around my shoulders and I was pulled against a hard familiar body. I smelled wet pavement and damp wool and James. My skin sang, even through the layers of clothing, and there was water on my cheeks. He swung me into the notch of a church doorway, out of the rain, my back against the brick. "Come here," he said, and kissed me. 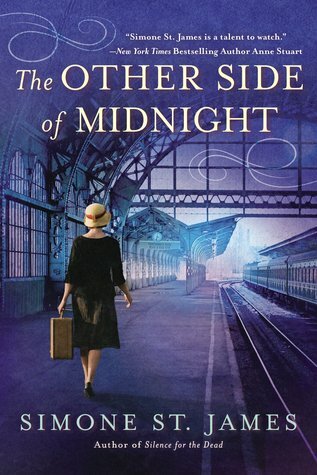 I'm glad I bought my own copy of The Other Side of Midnight instead of waiting to get one from the library, because this is one book I'll want to read again. (And again.) Oh, and for fans of St. James' earlier novel, An Inquiry Into Love and Death, Drew Merriken (the Scotland Yard Inspector from that novel) makes an appearance in this one, too, which was a lot of fun. 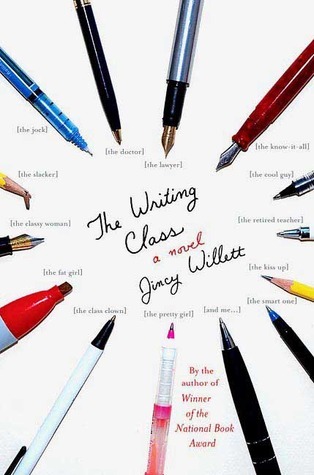 Take one university extension writing course with a has-been author, over a dozen wannabe writers, and one sociopath who goes from prank phone-calls to threatening critiques to murder over the course of the class, and you have this funny mystery by Jincy Willett. I liked how her characters seem like mere cliches at the start of the class, but become very real and likeable as their teacher gets to know them. It's the interactions of these characters that make this novel so much fun. That and their trying to figure out who the murderer is all while knowing he or she is one of them. It creates a nice tension while maintaining a lighter, humorous note. Plus, it's about writing and wanting to get published...a subject I always enjoy reading about. I ended up liking this mystery a lot. Yay! Another happy find from the W shelf. Can't wait to see what I stumble across next. I've been really good this year and haven't purchased a single book. (I've been trying to read the books I already own first.) But then my library had a used book sale and I picked up a couple of titles that look interesting for just 50 cents. I mean, for that price, who could resist? I had to buy it. And since I was buying one book, I decided to splurge and throw a few other titles into my cart while I was at it. So, what did I end up buying? 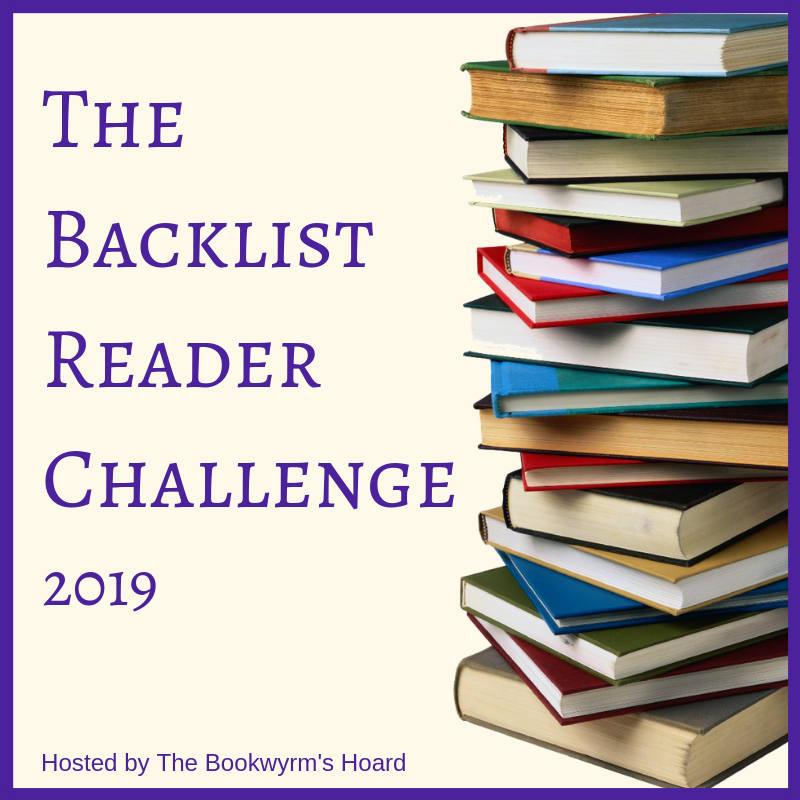 St. James' earlier novel, An Inquiry Into Love and Death, which I love, and Barbara Erskine's Whispers in the Sand, which I haven't read, along with Treasure of Egypt by Barbara Ivie Green and The Poisoned Chocolates Case by Anothony Berkeley. I feel much better. Because a little bookish happiness goes a long way. First Line: Once upon a time--for that is how all stories should begin--there was a boy who lost his mother. Summary: That boy is twelve-year-old David. Grieving for his mother, David turns to his books for comfort. But the stories whispering through their pages want something from him in return. As his mother once told him, "Stories wanted to be read. They needed it. It was the reason they forced themselves from their world into ours." Only this time, they manage to lure David into their world instead--a world full of strange creatures, twisted fairy tales and dark magic. Now David must somehow find his way back home. My Thoughts: David is a great character--still only a boy, lost and alone and having to battle his own fears, anger, and jealousy, all while struggling to grow up; I liked him a lot. I also liked the characters he meets on his journey, especially The Woodsman. In many ways, this book reminded me of the second half of the musical Into The Woods. Parts made me laugh, other parts made me sad; but altogether, this book has an ending worth reaching. Despite its premise and fairy-tale aspects, it is shelved in adult fiction. Go figure. So, if you want to lose yourself in a good read, check this one out.